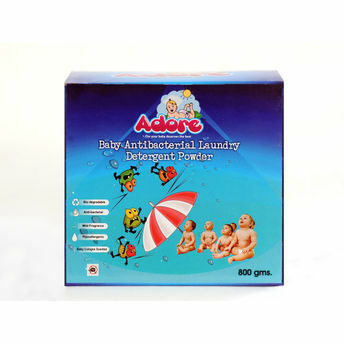 Adore Baby Antibacterial Laundry Detergent Powder is a next generation baby cologne scented low foaming, chlorine free, antibacterial, soft laundry detergent which is blended with rinsing additives, optical brighteners and anti redeposition agents. Rinsing additives ensure a stain free wash while optical brighteners enhance the appearance of clothes. Composition is antibacterial, machine friendly, skin friendly and is ideal for delicate and sensitive fabrics like baby clothes and maternity wear.